After spending the night in San Diego, Jack and Jason headed back to Drew's Mirror Wall Studio. In the afternoon, the two of them hiked from Drew's house up to the Griffith Observatory. It is about six miles round trip. 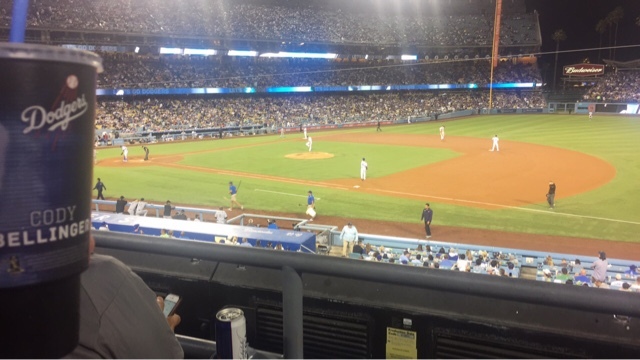 The plan for the evening was seeing the Los Angeles Dodgers play the Chicago White Sox at Dodger Stadium. Although Jack said that he didn't remember it, Sharon, Morgan, Jack and I saw a game at Dodger Stadium in 2005. A picture is here. With the game tied 1 to 1 in the bottom of the eighth, Joc Pederson got hit by a pitch with the bases loaded to force in the go-ahead run in a five-run eighth inning. Peterson was hit in the upper right thigh by a pitch from Jake Petricka, forcing home Yasmani Grandal with two outs and opening the floodgates for a Dodgers offense that had been stifled most of the game. By the end of the inning, Los Angeles had batted around in taking a 6-1 lead. The Dodgers are 50 games over .500. They might challenge the record for the most wins in a season this year. The boys headed back to Mirror Wall Studios after the game. The plan for Wednesday is Disneyland!